Here are 10 cubicle pranks you can do to 'vandalize' a cube. You won't actually 'vandalize' a cube, but 'redecorate' it instead. You need a camera or a camera phone for this one. Take a photo of the each removable item (e.g. mouse, pen, stapler, cup, LCD screen, keyboard, chair, CPU, printer) on your victim's table. Label each picture with the name of the item underneath and print each separately on sheets of paper as shown in the diagram. 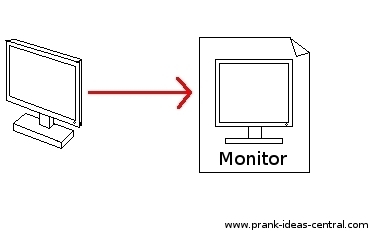 On the day you want to setup the prank, write where you want to hide the item, e.g. the keyboard, behind the corresponding picture. For example "your keyboard is in the supply cabinet". Go into the cube, remove and replace each item you've targeted with the corresponding printed sheets. You can use tape to tape it down. Imagine the surprise of your victim when he or she gets back to find all the cubicle items have become 2D. Grab a roll of tape and make little strips about 5cm long. 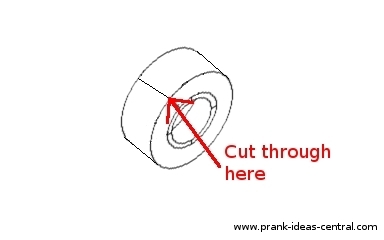 You can cut through the tape roll to achieve this. Tape all surfaces in the cube with your little strips. Alternatively, use sticky notes. For this cubicle prank, you'll need to make it look and smell like a drunk got in an messed up the cube the night before. Get a piece of fake barf and place it on the cubicle floor where it's obvious. Make sure you pour some water (or beer) over the 'vomit'. Smuggle in some empty beer cans, crush some of them, and litter them around the cube. Optional: Scatter a few pieces of fake poop laced with water and toilet paper. If you want, bunch up and stain the toilet paper with some chocolate, and leave the toilet paper roll in the cube. If the waste-bin can hold some liquid, get some yellow food coloring, mix it with water to make fake pee and fill it quarter-way. Be sure to leave traces of 'pee' on the edges of the bin. This cubicle prank will require some help from fellow pranksters in the office. Buy a couple of packs of balloons (about 300 balloons total!) and rope in the rest of your colleagues to inflate them and you'll have enough to fill up a cubicle. Just make sure you seal the entrance with a large piece of cardboard before filling up the cubicle. In the last office I worked in, we were given plants to 'adopt' as a program to promote a greener office. Soon after potted plants galore started appearing in the common areas. So I thought that I should give them a proper home too. Unfortunately for my victim, it meant his cubicle. In the cover of after office hours, shift as many plants as possible from the corridor into your victim's cube. Alternatively, you can move waste baskets from other cubicles into your victim's cube. This cubicle prank should be set up when no one's around. Well, it's more blessed to give than to receive, so give your victim the gift of a cubicle prank wrap. Estimate the amount of gift wrapping paper or aluminum foil you'll need to wrap the entire outer cubicle like a giant gift box. Alternatively, wrap each individual item. I found it more practical to wrap each item with foil. Nothing beats giving your colleague a new perspective on how things should be stored. Get some Velcro. Use it to stick every loose item you can find in the cubicle (dustbin included) to the wall or under the table. Spare nothing. If you have some Velcro left over, use it to stick the chair to the table and to the ground. 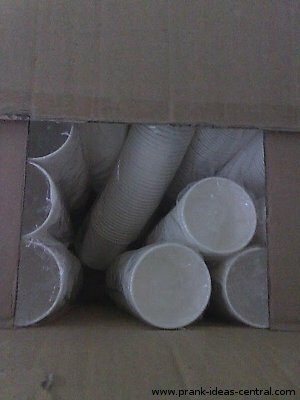 Grab 160 paper cups from the break room, otherwise bring your own. Place them all upright on any surface you can find. Staple them all together and then fill all the cups with water. Your victim will find this prank rather hard to remove. The idea is to litter every surface in the cube with something. You can use either paper clips, or shredded paper. Confetti, flour or glitter should work too. Practically any stationery you can find goes well with jelly. Get some gelatin mix (Konyaku Jelly might work best) and follow the instructions. It should be as simple as 'mixing the powder into boiling water and allowing it to cool' in a mold. Put the stationery into the mold before the mix hardens! Remove the jelly from the mold at the cubicle desk.